This is the latest film produced by studio Ghibli. It's a very pretty, very very pretty looking movie. 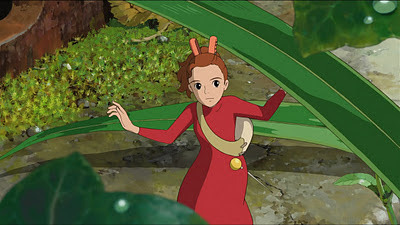 It has the usual Ghibli touchs including the emotion swings and the blatant undertone about the environments. It's quite enjoyable. But, that's about it. Personally, I was never a big fan of studio Ghibli's film. Reason being that even though each of them comes with a somewhat different theme, they more or less all have the same core. Basically, if you have seen one, you more or less have seen them all. Sure they're all pretty (and getting prettier dare I say) and got all the sad moments designed to make you cry and all, but, that's about all there is to it. They just don't seem to have much of anything beyond that. I have never come out of a studio Ghibli movie feeling "Wow, that was something!". As good as they all looked, there's just never a long lasting impression. It's like they have one deck of cards with movie elements, and every time they're trying to make a new movie, they simply shuffle them all and read them off to create a plot flow. Anyway, Karigurashi no Arrietty is a good and interesting movie, but it's far from a great movie. If you want to see a pretty movie, it definitely won't disappoint you. But if you want to see something great, well, I think it falls quite a bit short.